Guidelines integral to creating policy that is fit for the present and the future. Our methodology for Future-Just Lawmaking offers a new approach to policy analysis providing a coherent, participatory and comprehensive tool for best policy practice in sustainable development. The methodology provides a practical tool to assist policy-makers to design, amend or evaluate laws, supporting the work of national, regional and local government, international organisations, public policy institutions and civil society. The 7 Principles are based on the 2002 International Law Association Delhi Declaration on Sustainable Development Law. They were adopted by the 192 states participating in the World Summit on Sustainable Development in 2002. The 7 Principles reflect the interconnected nature of the challenges we face and help avoid unintended consequences and inconsistencies in our policy-making to address these challenges. Will the law result in fair and sustainable use of natural resources? Will the law improve social justice, gender equity and indigenous rights? Will the law promote prevention and precaution in the face of scientific uncertainty? Will the law provide procedures and opportunities for public consultation? Will the law promote peaceful conflict resolution and reduce fear and want? Will the law integrate social justice, environmental protection and economic stability? Will the law reflect the local reality as regards technology, resources, values and traditions? exacerbating wealth inequality as well as encouraging disregard for the environment and sustainable development. Future Justice is about adapting and changing policies to new scientific evidence, so that we can begin transforming our world. It is a path towards a more secure, just, equal and creative world. Future Justice means putting the values that are essential to our survival at the heart of every law, and every policy. 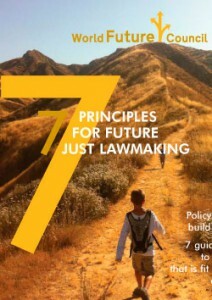 To help with this, our leaflet explains the seven policy principles for future-just law-making. If you would like to find out more about our work, please get in touch. We look forward to hearing from you!